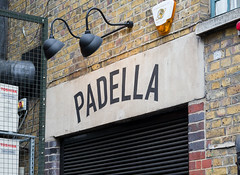 Padella opened early in Borough Market, a location that almost serves as a barometer for the London food scene. Way back in 2008 was my first visit to Borough Market (on a visit with Abby from Eat the Right Stuff, and it was still primarily a produce market, and most of it only open on Friday and Saturday. But even then it had some gems (like Monmouth Coffee Company) and some up-and-coming trendy places (like Roast), and was sprouting a halfway decent food court on market days. Well, fast-forward a few years, and while much of what was in Borough Market in 2008 is still there (including the same Turkish Delight vendors), it’s now open every day of the week (although, especially for produce, Fridays and Saturdays still reign supreme), and in some ways, it’s become almost the epitome of what I don’t like about “foodie” culture: hipsters, foodies, and tourists all crowding in and queuing up in ever-lengthening lines that make you wonder when the whole system becomes untenable (not yet, at least). But in that mess, the occasional Good Idea[tm] still comes about, and both Krista and I had heard good things about this new Padella joint, which is basically built on a single, simple concept: making fresh-handrolled pasta and serving it up small-plate style in some simple dishes, in a casual open-kitchen environment with no reservations (and the resulting long lines). But, making use of the fact that London is still not a city of early risers, we tackled the lines in the most non-British of manners: we simply showed up 15 minutes before they opened and sipped coffee while waiting for them to open their doors. By the time they actually opened promptly at noon, the queue extended a good 100′ down the sidewalk. Inside, it’s a cozy setup spread over multiple levels, with a large open-air kitchen where the fresh pasta (that they rolled out in the morning) is cooked and finished with a variety of sauces. The menu is simple, bread, salads, a few other simple starters, and a variety of small pasta plates featuring the different daily pastas. 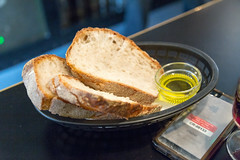 Initially, we ordered up two starters: bread with oil, and a simple plate of spinach cooked up with chillis and anchovy. The bread was a nice way to start: if I’m going to pretty much any sort of Italian place, I always find the bread to be a good initial gage of quality (especially pizza places; if a wood-fired pizza place can’t do a decent loaf of bread, the pizza will dissapoint even more). And here they do a good job: a light sourdough with a really nice, chewy texture, a good crust, and even a little bit of smokiness and char, served up with a pleasant Puglian olive oil, this was a nice start to things. Next up, some spinach with chillis and anchovy. 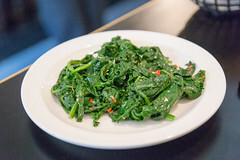 I always enjoy what, in my days of Southern living, would have been labeled a “big mess of greens”, and they did a good job of it at Padella: a generous pile of spinach (knowing first-hand as a cook how a gigantic pile of spinach quickly wilts to near-nothing), lightly seasoned with some good oil, a light amount of chillis, and a smattering of anchovy, this was also right at the nice borderline between “still green” and “wilted to oblivion”. Overall, a good second starter. 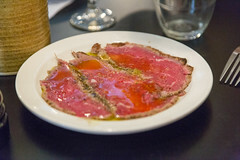 Rounding out the starters was a pleasant plate of carpaccio, served up nice and thin with a generous amount of Maldon sea salt, cracked black pepper, and some more good olive oil. A basic dish, but very nicely executed with each tender bite of beef having the right amount of meat, fat, oil, and pepper. Moving on to the pasta, we opted to split five of their small plates among the three of us, which turned out to be a reasonably good division. The pasta ordered arrived as fired from the kitchen, so it was a nice bit of timing with a new plate of pasta showing up as we were still finishing the previous plate. First up was a taliatelle with nduja. Remember my rant in the last post about how dukkah was one of the hot food trends of 2016? Well, nduja is the other one. For those that haven’t encountered it yet, nduja is a spicy, pork salumi that basically resembles a softer, spreadable, and more peppery version of pepperoni, and it actually works well in a dish like this. 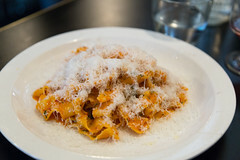 And the taliatelle wasn’t bad either: nice, still toothy but tender piles of ribbon mixed with a light tomato sauce and the nduja, with a nice layer of grated parmesan cheese on it, this was an enjoyable, simple pasta dish. 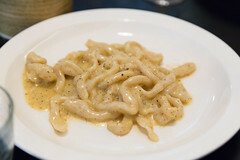 Next up was Pici cacio e pepe. Made with pici, which I basically describe as an open-side bucatini, this combines well with a basic cream, romano, and black pepper sauce. Again, the pasta here was cooked to al dente perfection, and it nicely soaks up the cream sauce. Another winner. Next up was a pappardelle dish. I’m always a bit hesitant to order pappardelle, primarily since it’s one of the examples of how the shape of pasta really influences taste and texture. Pappardelle, being wide, sheet-like noodles, is substantially more fussy about cooking time; too short and you end up with tough papery sheets that don’t take a sauce, but even a little too long and it started breaking up under its own weight. But here, they nailed it: soft folds of al dente pasta, nicely sauced with a thick, rich, beefy ragu that nicely clung to the noodles. 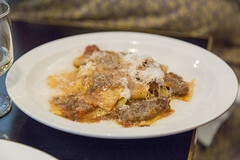 This dish has gotten me back onto pappardelle, and was good enough we ordered a second plate. Last up was a plate of ricotta ravioli, served up in a sage butter sauce, and this was a good expression in simplicity: nicely executed, pillowy ravioli with a pleasant ricotta filling, served up with a smooth sage brown butter sauce. 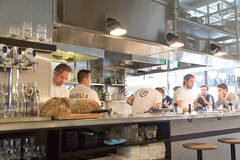 Overall: I rather enjoyed Padella, enough so that I’m tempted to go back there on a future visit, even with the lines. 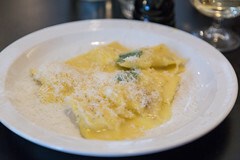 The pasta was exceptional, the starters good, and the service fast and efficient; and at all that, the prices were actually quite reasonable, especially in comparison with most other places around Borough Market. I can easily see why this place has a line, since they’ve got a good product served up well. A hearty thanks to Krista for inviting us out! Well, after six days in Belgium, it was time to pack up our bags, head back over to Brussels’ Station Midi, and take the Eurostar back to England. Two hours later, we found ourselves back in Central London at St Pancras station, and a short tube ride down the Victoria line had us back in Pimlico. And, after that voyage, we were starting to get hungry, but several days of eating mussels, steaks, filet americain, and the like had us craving something at least a bit healthier, so we decided it was time for a trip down the street to get some falafel. Luckily, my brother lives off of Tachbrook Street, home of the Tachbrook Street Market. While Tachbrook Street has been a nice little street market for several years (longer than I’ve been coming to London), a few years ago the Westminster City Council did a substantial renovation: the road is now more or less permanently a street market and not a vehicular passage, utility hookups are provided for all the vendors (in neat little boxes that fold up out of the street), and most importantly, it has a lot more vendors and more regular hours. Monday through Saturday, 8 am through 6pm, the places is filled with vendors, most of them food vendors, ranging from grocers, to a coffee stand, to prepared food vendors, all selling from their stalls. And one of the more regular vendors is a Middle Eastern falafel joint, Veg As You Go.